Located at the end of Marginal Way in Portland, the East End Wastewater Treatment Facility has been in operation since 1979. 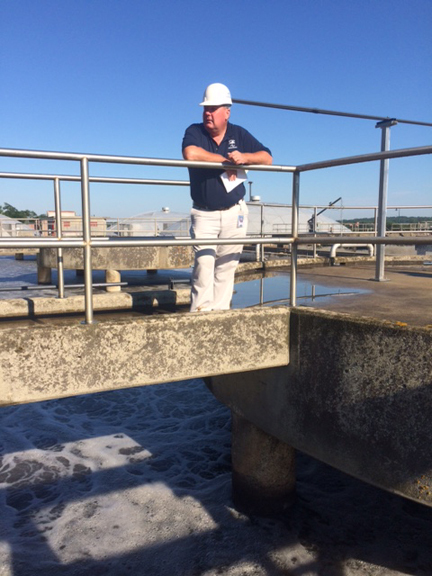 The facility treats roughly 20 million gallons of wastewater a day. In 2014 work began on planning and design of an upgrade of the facility’s 36-year old aeration system. Construction began on a $11.4 million dollar project in 2015 and is expected to be complete by the end of 2017. 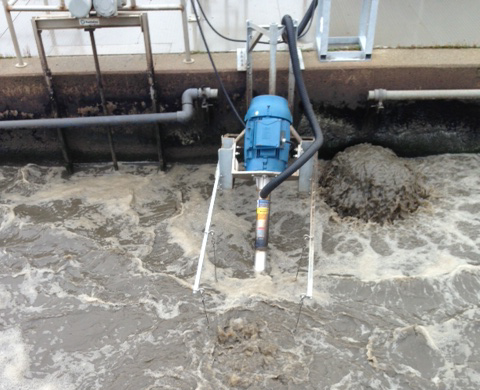 Aeration is a critical biological component to wastewater treatment. 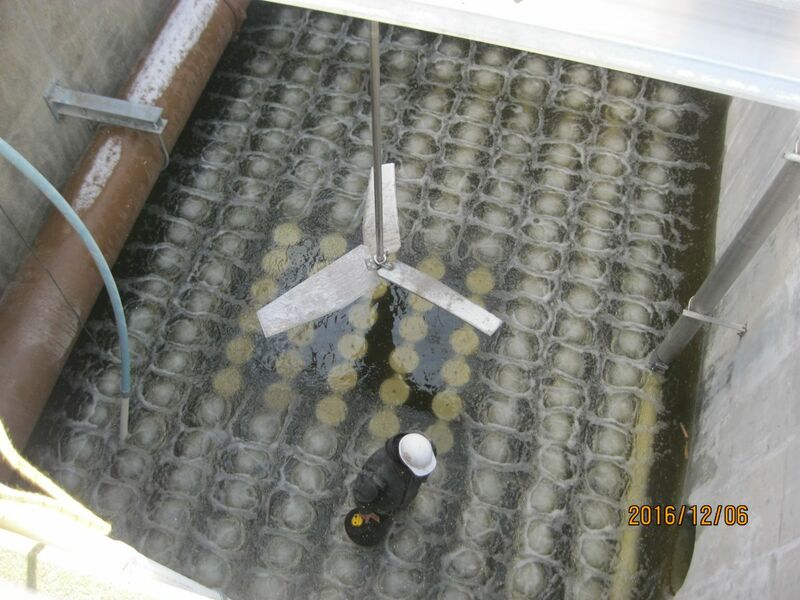 The aeration system, which has reached the end of its useful life, is being updated to increase operational performance and maintain compliance with permit conditions. The project will replace mechanical surface aerators with a modern process that diffuses air more efficiently through the bottom of the tanks. Efficiency Maine has recognized the project’s energy efficiency with a $200,000 grant. Engineering services are being provided by Hazen and Sawyer, and Penta Corporation is the general contractor. The project was approved for low interest financing from the Maine Clean Water State Revolving Fund, which is expected to save $1.9 million in interest expenses over 20 years. 7/18/17: After nearly 2 years of construction, the final of three upgraded aeration basins is being readied for service. The basin is being filled with clean water so that testing of the mechanical system can begin. If all goes well, the basin will be placed into service in a few weeks. 1/13/17:The second of three aeration basins has been upgraded and has been placed into operation. While we finish testing on the new tank, our contractor has taken the third and final tank out of service and will drain and clean the tank in the coming weeks. Work on the final tank will begin once it has been cleaned. 12/6/16: Ahead of schedule, equipment is being tested in the second train. 11/4/16:The project is on schedule, concrete work has been completed, workers are finishing up on removing forms and other debris. The air diffusers are installed in zones 4 & 5. September 13, 2016: On site today is a team from Weston and Sampson 's Construction division, they are installing 2 AIRE-O2 mixing units in the front cell of # 1 Aeration Basin. Each unit will supply additional oxygen into the front cell to help reduce odors that are currently being generated in this basin. This is the last remaining basin equipped with the original mechanical splash mixers. It is scheduled to be taken out of service in early December as part of the plants aeration system upgrade project. August 18, 2016: The second tank has been drained and cleaned and work has begun to upgrade that tank. August 15, 2016: The new aeration tank has been working well and today efforts to drain the second tank began. There may be temporary odors associated with the draining of the tank. Don't miss the open house Thursday, August 18 at 11:00 a.m.
August 4, 2016: Plant Manager Steve Sloan oversees start up of the first aeration tank this morning. August 2, 2016: The new 400 Hp aeration blower ran smooth during its 24 hour test, now testing the second one of three. August 1, 2016: The first train of the new aeration system has been filled and testing and start up has begun. July 2016: The diffusers have been installed in the first aeration tank and the new tank is expected to go online the first part of August. This is anticipated to alleviate some of the operational and odor issues that the plant has been responding to over the past two months. 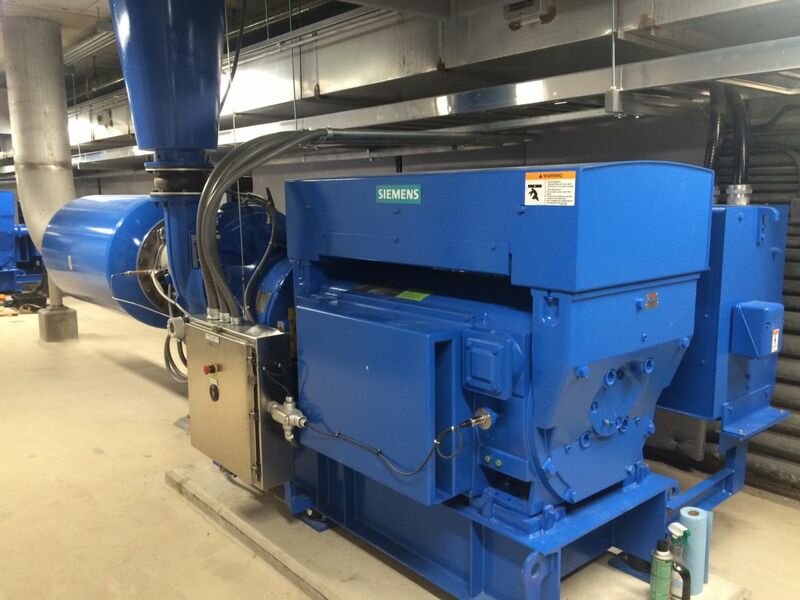 In addition to challenges related to operating the plant with one less aeration tank, warm temperatures, humidity and equipment failures have impacted processes. 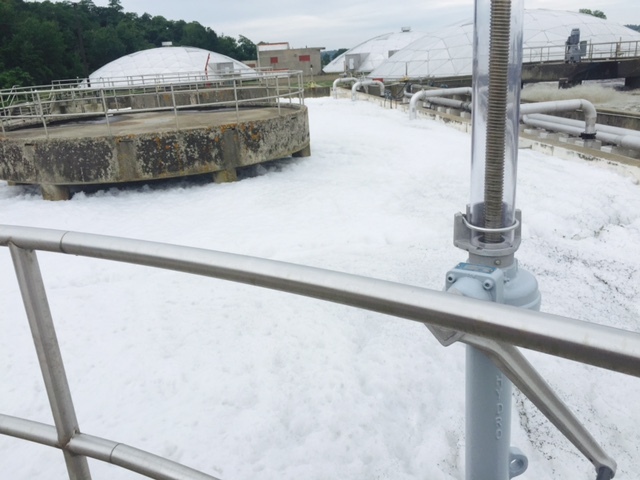 The plant has temporarily suspended septic tank waste deliveries and is using temporary aerators to improve performance. September 2015: The Portland Water District held an open house and invited media and the public to attend to learn about the project. An important and challenging aspect of the project is to maintain plant operations while sequentially upgrading each of the three tanks. The following timeline was provided to attendees. 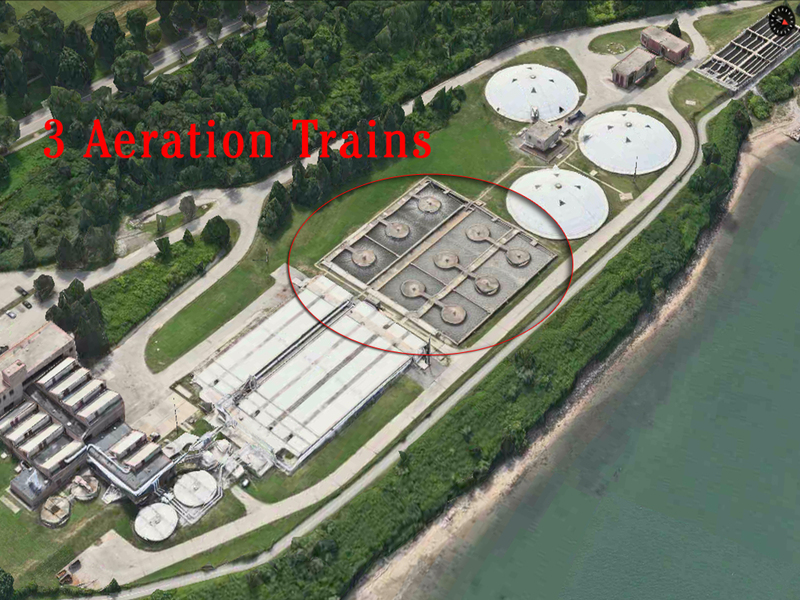 August 2015: The first aerator train was drained and cleaned.